1" wide webbing. Zinc-alloy plated finish buckleEasy to operate ratchet handle, with quick release. ..
Adjusts from 30"-60". Unique angle adjustment (patent pending) from 0 degrees to 36 degrees with 12 ..
Strong 2" wide webbing. Quick release (over-center) buckle. Zinc alloy plated finish. Heavy gauge, v.. Comfortable Sur-Grip rubber coated handle and easy access dual release lever. 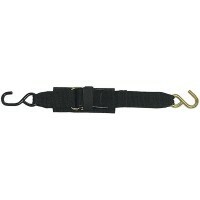 Simple, one-hand opera..
Kwik-Lok bow tie down features 1", 2, 500 lb. nylon webbing and a zinc coated steel hook. 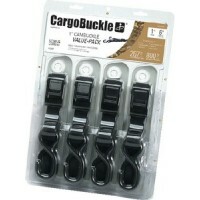 For maximu..
All purpose cam buckle pack features 1" cam buckle, nylon webbing and two vinyl coated S-hooks. 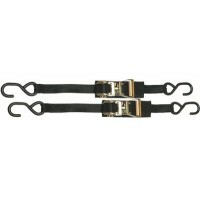 This..
Boatbuckle - bracket Card: Universal Mounting Bracket KitType: 5000 lbs. / pairBreaking Strength: 14.. Pro Series gunwale tie-downs feature SUR-Grip Kwik-Lok buckle for maximum comfort. Built-in closure ..
Kwik-Lok models with 2" polyester web. Stainless steel hardware.Clamshell packaged. Size: 2" x 10'Br..
Kwik-Lok models with 2" polyester web. Stainless steel hardware.Clamshell packaged. Size: 2" x 13'Br..
Kwik-Lok models with 2" polyester web. Stainless steel hardware.Clamshell packaged. Size: 2" x 16'Br..
Kwik-Lok models with 2" polyester web. Stainless steel hardware.Clamshell packaged. Size: 2" x 20'Br.. Features 5, 500 lb. 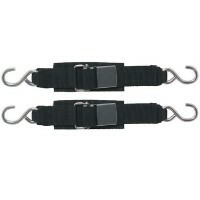 polyester webbing and vinyl covered steel hooks. Clamshell packaged. Size: 2" x .. Heavy-duty double J-hooks. Designed for quick and easy adjustment. Strong 1-3/4" nylon webbing. 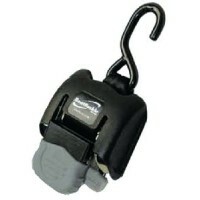 Rate..
360° Rotating hook ensures an easy and secure attachment to almost any trailer. Large contoured hand.. 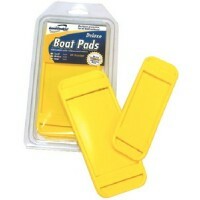 Protective boat pad 3in 2/pk Pack: 2Size: Medium - 3".. 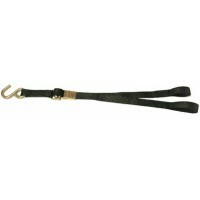 Features durable nylon webbing, vinyl-coated steel S-hooks with soft hook. Clamshell package. Size: .. Solid steel core with solid weight bearing surface. Strong and durable nylon webbing. Two vinyl coat..
Ratchet gunwale features a 1" stainless steel solid-core ratchet for maximum power and durability, s..
Boatbuckle-transom ss 1 pr/pk Pack: 2Type: TransomBreaking Strength: 3000 lbs./pairLength: 14"-43".. Double J-hooks with keeper. 1" wide webbing. Designed for quick and easy adjustment. Rated strength .. 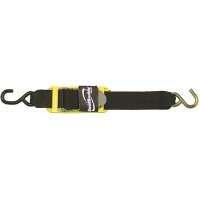 Pro series Kwik-Lok transom tie downs feature Sur-Grip Kwik-Lok buckle for maximum comfort. For adde..
Kwik-Lok style. All stainless steel parts throughout. Polypropylene webbing and protective web pad. 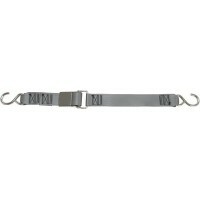 ..
Kwik-Lok style buckle. 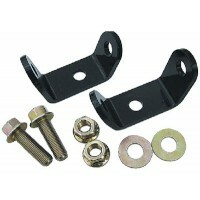 Vinyl coated top hooks and zinc-coated trailer hooks. 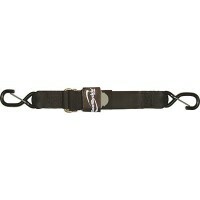 Polypropylene webbing a..
1" wide weather-resistant nylon webbing and self padded handle. 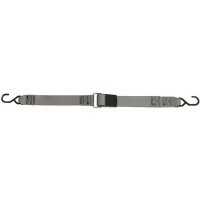 Quick lock buckle with spring loaded..
Strong weather-resistant polypropylene webbing, heavy gauge hooks, coated hardware, and rapid ratche..
1" Wide weather-resistant nylon webbing, heavy gauge hooks, coated hardware, quick release and rapid.. Tie down has padding that prevents unattractive transom damage. Sturdily constructed from 2" wide we.. Rugged 4' transom tie down. Wear resistant polypropylene webbing withstands the many rigors of the r..
A long lasting protective panel made of high durability plastisol designed to protect boat finish. T..
1" Wide weather resistant polypropylene webbing, heavy gauge hooks, coated hardware, rapid ratchet m..
Cambuckle tie downs with vinyl coated S-hooks to protect boats' finish. Black. Card: 2Size: 1" x 36".. Provides super strong holding power. Vinyl coated J-hooks protects the boats finish. Size: 2" x 10"T.. Provides super strong holding power. 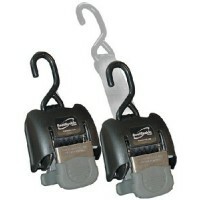 Vinyl coated J-hooks protects the boats finish. Size: 2" x 13"T.. Provides super strong holding power. Vinyl coated J-hooks protects the boats finish. Size: 2" x 16"T.. Provides super strong holding power. Vinyl coated J-hooks protects the boats finish. 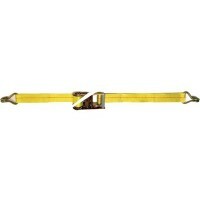 Size: 2" x 20"T..
Surelok transom cambuckle tie downs lock in place to eliminate slippage. The protective housing prev..